I’m on a seafood diet. Every time I see food I eat it. Go on groan, it’s a terrible joke as old as the hills. But as far as we’re concerned there’s an element of truth to it. Most of the time when we see seafood on a menu we’ll order it rather than a meat dish. I love the diversity of flavours you get with seafood and, generally speaking, they excite my taste-buds more than meat. Therefore Britain’s Seafood Week each October presents a good excuse to indulge a passion. 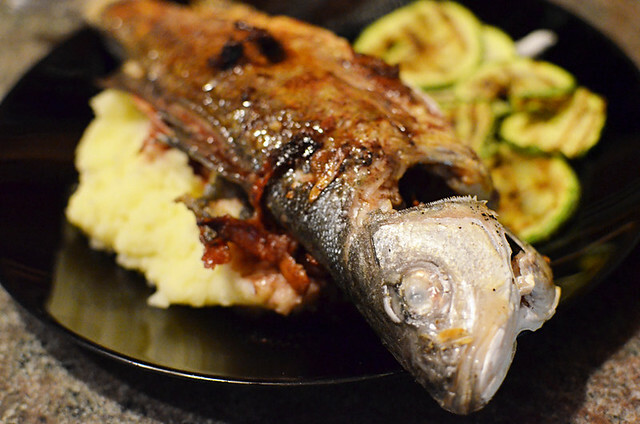 The idea of the campaign is to encourage people to eat more fish and seafood. It’s ironic that on an island where fish and chips is a national dish so many people can be hesitant about eating fish with the head still attached or seafood which isn’t prawns or scampi. This year Seafood Week runs from 6 to 13 October with a different fish or type of seafood being promoted each day. This year’s choice selection includes cod, mussels, mackerel, prawns, plaice, sardines, tuna and haddock. Apart from possibly mussels, it’s a relatively safe selection of UK crowd-pleasers. I like all of those included on the list, but some wouldn’t make it on to my top 10 choices of fish and seafood. These battered strips of cuttlefish are a new entry on my ‘favourites’ list. 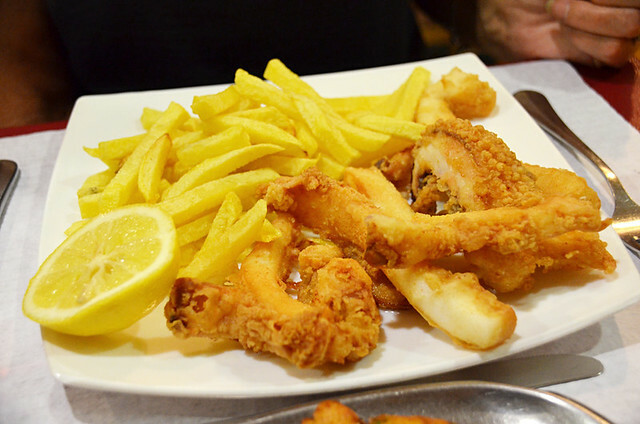 For years I’ve tried cuttlefish in Spain every now and again. Whilst it’s been okay it has never been outstanding. Choco frito in Portugal, on the other hand, has astounded my taste-buds. It’s cuttlefish Jim, but not as we know it. It’s tender, delicious and relatively cheap. Being fried in batter and served with chips is just a bonus to someone from the West of Scotland. Tuna is one of those fish which even people who don’t like fish eat. Maybe because it usually comes in a can and looks nothing like fish. 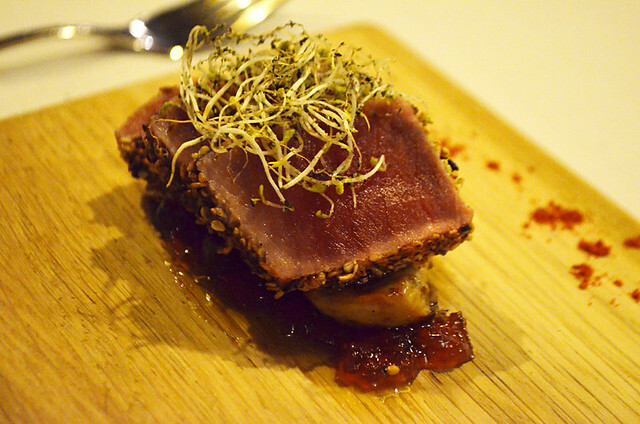 Like many other people I like tinned tuna, but in recent years the tuna dish which has really got my juices flowing is tuna tataki, a Japanese culinary term for searing the fish on the outside but leaving the middle raw. A coating of ginger, soy, sesame seeds and chilli add that perfumed eastern zing to what is a gorgeous looking and tasting dish. In one of Rick Stein’s cookbooks he commented that no matter how hard he tried to push them, mussels were never a popular choice at his seafood restaurant in Cornwall. I can take or leave those tired looking mussels you find plonked on top of pizzas or which have been swimming in paella for hours. 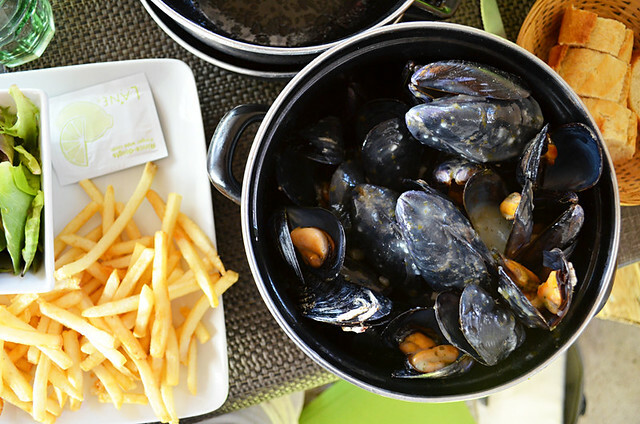 But a fresh-out-of-the-pot bowl of moules (et frites) is an orgasmic eating experience. Anyone who comes out with the ‘octopus is rubbery’ excuse for not eating it has never eaten good octopus, simple as that. I’ve exercised my jaw muscles on poorly prepared octopus plenty of times so I can see why people believe the rubbery tag. But when cooked properly it’s easy to cut and eat, and is quite meaty in texture and flavour. 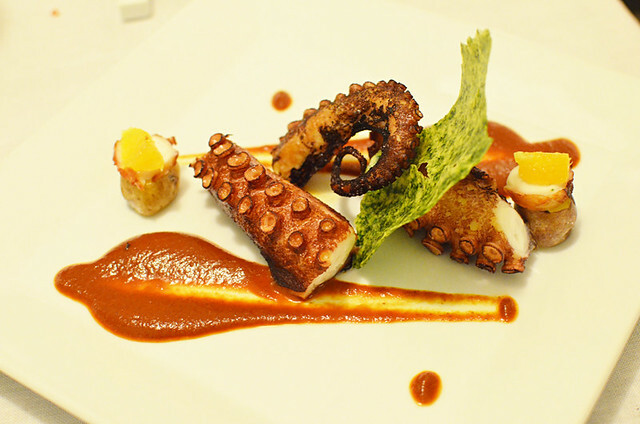 I’ve eaten octopus on La Palma, prepared by a Galician chef, I could cut with a fork. Sometimes basic is best. 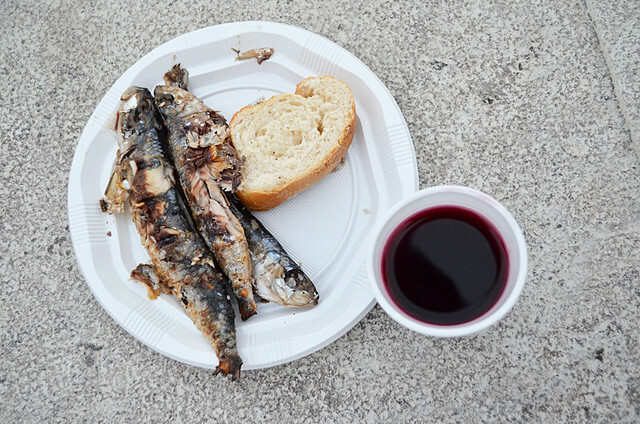 A plate of freshly grilled sardines with a chunk of bead and a glass of wine can be simple and sensational. We often go to a Sardinada in Puerto de la Cruz on Tenerife where hordes of locals line up beside a row of blackened old barbecues waiting for plates of sardines, sesame bread and rough ‘n” ready vino del pais served in plastic cups. First time I tried scorpion fish was as a mousse in Asturias. It was creamy with bags of flavour but it wasn’t until I tried the fish served in a more conventional manner (whole on a plate) that I realised just how good a fish this is. It is an ugly creature but it tastes sublime. I make no excuses for including squid on a list which also has octopus and cuttlefish. All are very different, especially when the squid I’m referring to are Spanish chipirones. 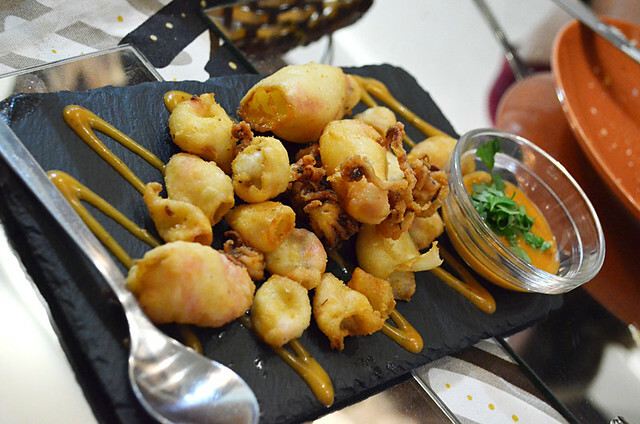 These are small squid which are pan fried and sometimes lightly battered. A drizzle of lemon helps their flavours explode in the mouth. They’re wonderfully tender and taste quite different from their bigger relations. For years I thought of salmon as one of those middle of the road fishes, inoffensive with no real standout flavour. That was until I ate a fillet which had actually been prepared properly (i.e. not had all its moisture cooked out of it). Now I’m a complete convert. 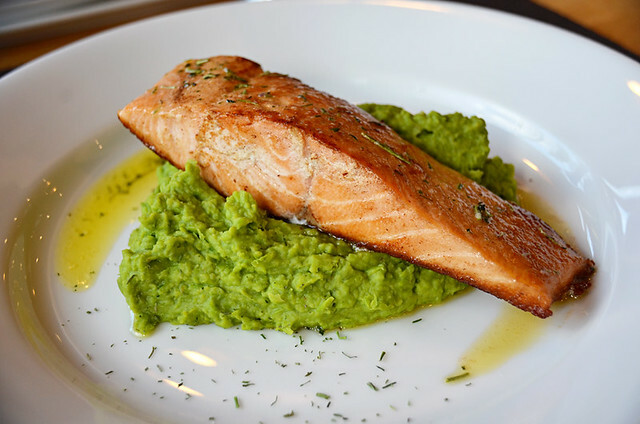 In Chile, one of the world’s main producers, I had salmon with mushy peas in a lodge overlooking the Baker River. It seemed an odd combination. But boy, it was an inspired pairing. 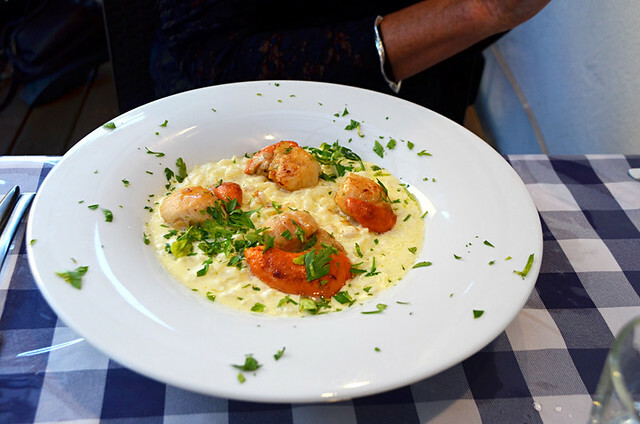 Scallops used to be a favourite seafood. However, as the best is found in colder waters, in over a decade living in the Canary Islands we rarely got to enjoy good fresh scallops. A couple of quality restaurants fly fresh scallops in from Madrid, but mostly scallops in the Canaries are of the frozen variety. Subsequently it’s still a novelty to sink my teeth into a succulent, firm and perfectly cooked scallop. On the Great British Chefs website there’s a sinful suggestion to try deep fried scallops in a beer batter as a twist on fish and chips. Sounds a winner to me. 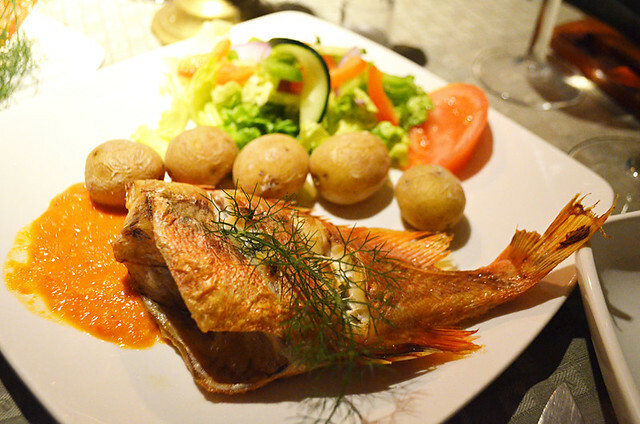 Simply a delicious fish which has become immensely popular across the globe. The meaty white flesh detaches from its bones easily and its flavoursome skin is tasty enough to stand alone. A yen for other fish might come and go but pan-fried sea bass will always be a top tenner.